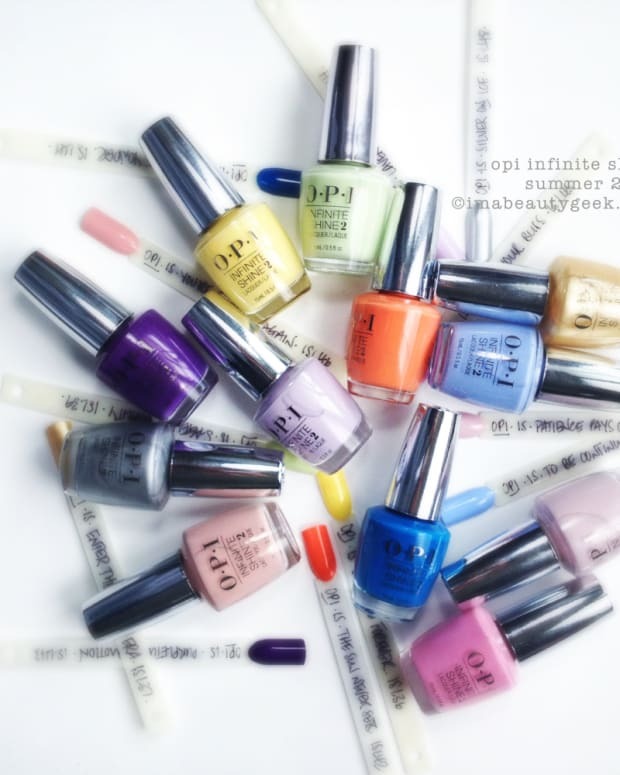 So you’ve heard there’s a new bunch of OPI Infinite Shine shades (12 of &apos;em) coming this summer, right? 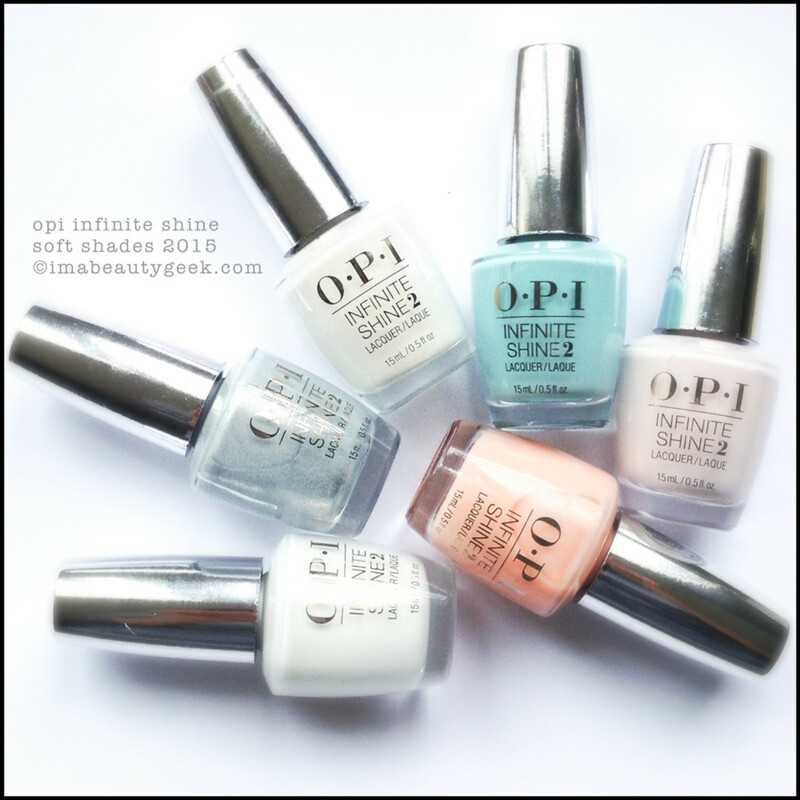 Yeah – I gave you a sneak peek in this OPI Infinite Shine Summer 2015 post. Now though, I&apos;ve got your preview swatches of even more Infinite Shine shades that are coming. They’ll be out in May 2015, and they’ll be Soft Shades. Wanna see? 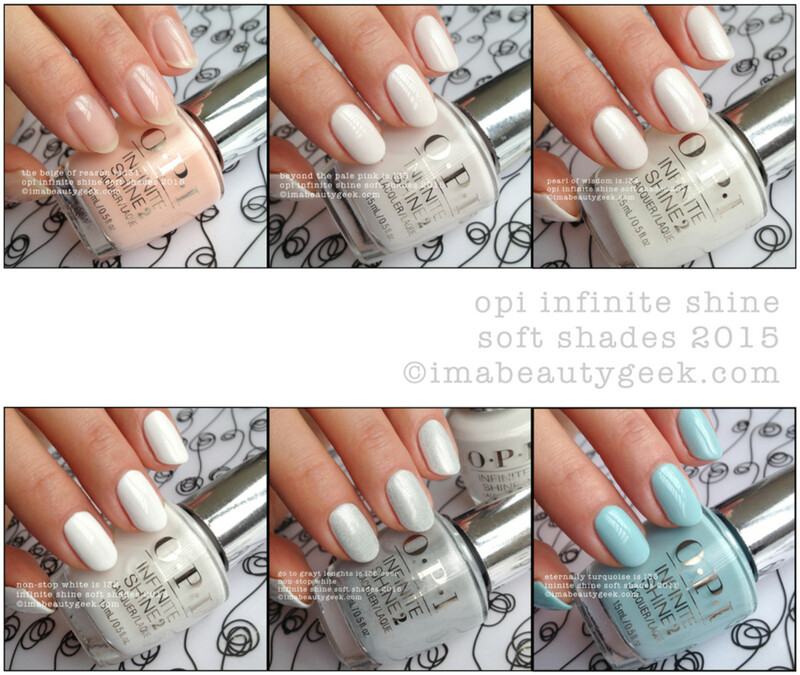 OPI Infinite Shine Non-Stop White – Soft Shades 2015 (above). Let’s start right here with this perfect white. I mean it looks perfect, right? Well it sorta is and sorta isn’t. That’s two coats. The first you need to get your lines clean, and the second, you need to get on in exactly the right thickness to avoid… bubbles. Yep, I actually got teeny tiny pin-prick sized bubbles in mine when I put it on too thick. I had to take it all off and re-do it. If you figure out the right amount of polish to use and you don’t slap it on really, really fast, you’re good to go. If you’re not a pro-painter (and I&apos;m not), skip this one or you’ll just end up throwing it at the wall. 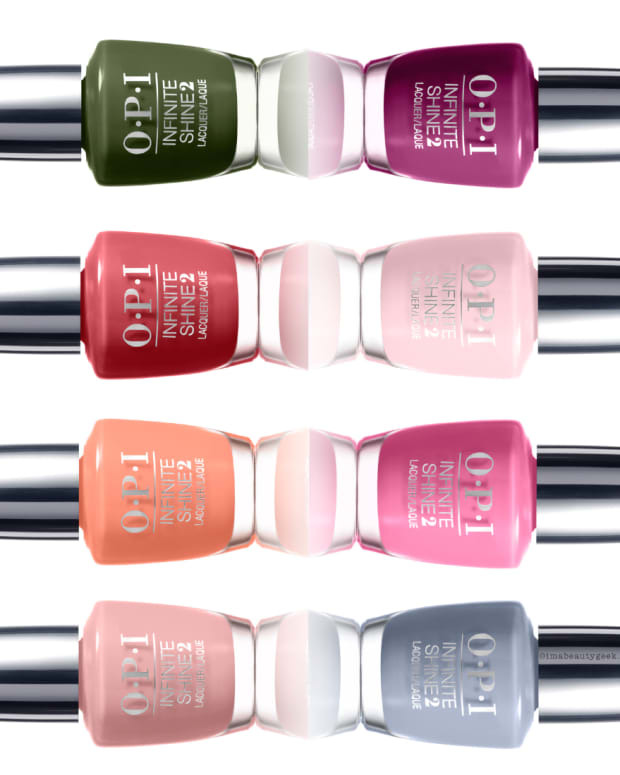 OPI Infinite Shine Beyond the Pale Pink – Soft Shades 2015 (above). This right here is my favourite shade from the collection. A beautiful pale, pink-tinted white that goes on much, much better than Non-Stop White. You’re looking at two coats in that photo and nope, I didn’t even put top coat on it. It’s so very pretty. I would spend my Crunchy Cheetos money on this shade after seeing it on. I would. 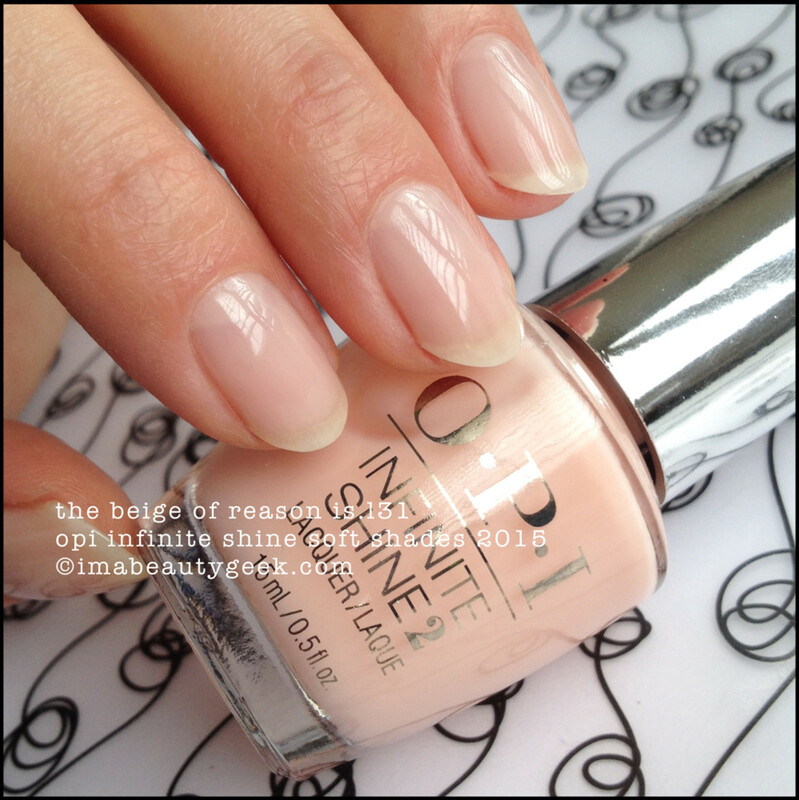 OPI Infinite Shine Beyond the Pale Pink – mattified (above). I matte because I can. I also matte because I can’t art. I’m calling this art. I’m also calling it awesomesauce. 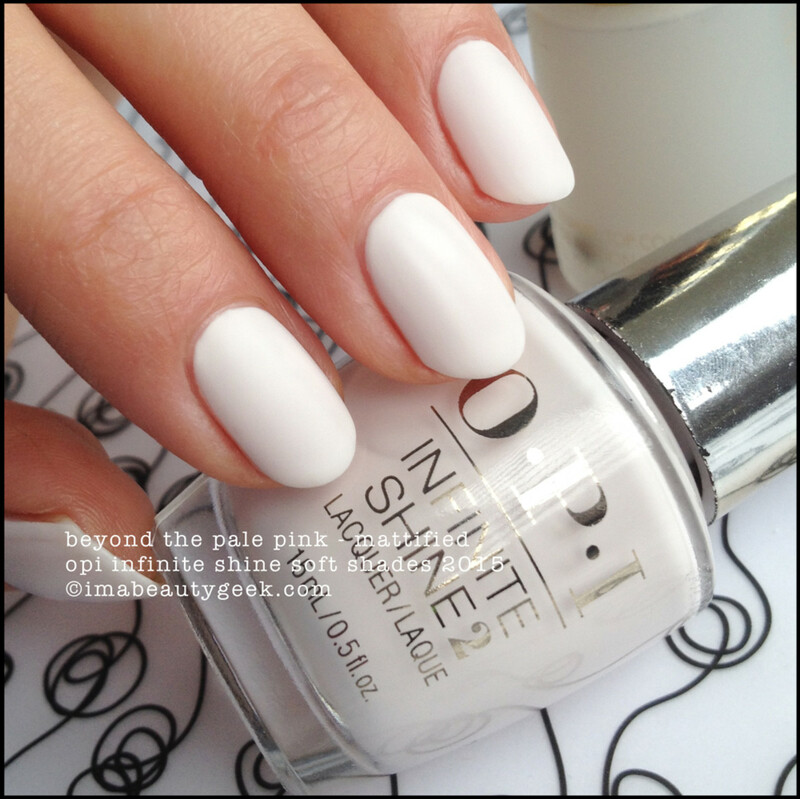 OPI Infinite Shine Go To Grayt Lengths over Non-Stop White (above). That’s one coat of Go to Grayt Lenghts (wow, that’s surprisingly hard to type) over two coats of Non-Stop White. It’s shimmery and yet somehow not bright. Silver but somehow muted. Pewter. It&apos;s pewter. Do I like it? I’m not sure. I think I like the subtlety of it. Maybe. OPI Infinite Shine Eternally Turquoise – Soft Shades 2015 (above). That’s two coats of a rather easy-to-apply pale mint. I’ve seen enough mint in the past couple years to last a lifetime. Yes, the formula is good. Yes, it’s shiny. Yes, I’m bored with mint now. But if you’re not bored yet, this one is an excellent choice. Light and lovely and perfect for spring. 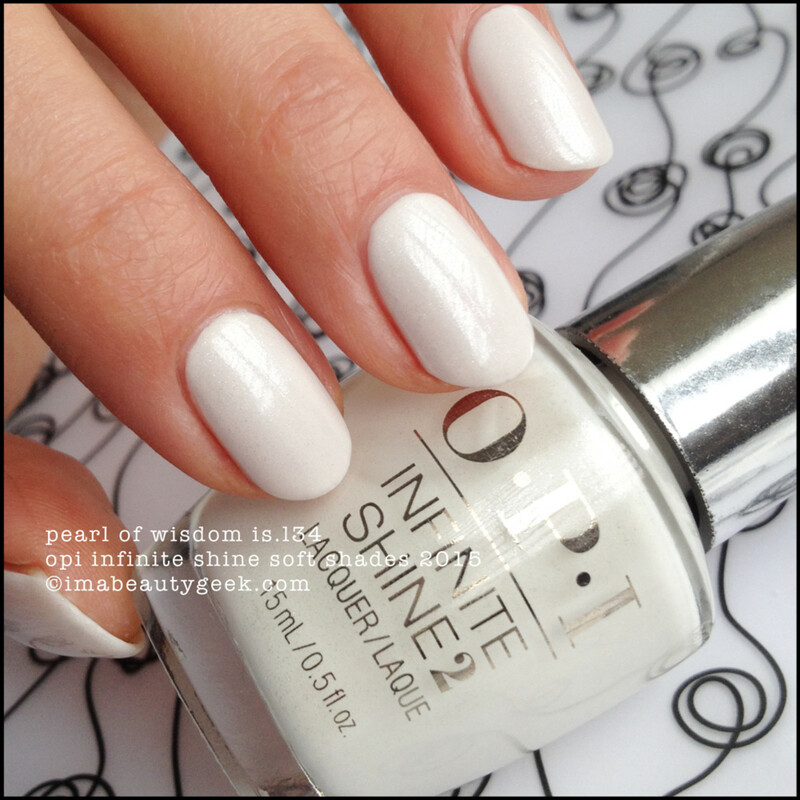 OPI Infinite Shine Pearl of Wisdom – Soft Shades 2015 (above). Huh. I’m pretty sure I have a Pearl of Wisdom regular OPI in The Archives…. Yep, I do. Actually, there were two: one is from the Far East collection (2000) and the other is from the Hong Kong Collection (2010). I don’t think I’m on board with this re-use of shade names between the regular and Infinite Shine lines. But we should talk about the polish. It’s got silver micro shimmer in it to lift it up and give it a subtle sparkle. It’s not pearlescent though – nope. You might also want to know the formula was thick. But, if you’re careful, don’t overload your brush, and keep your brush parallel to the nail, you’ll be okay. 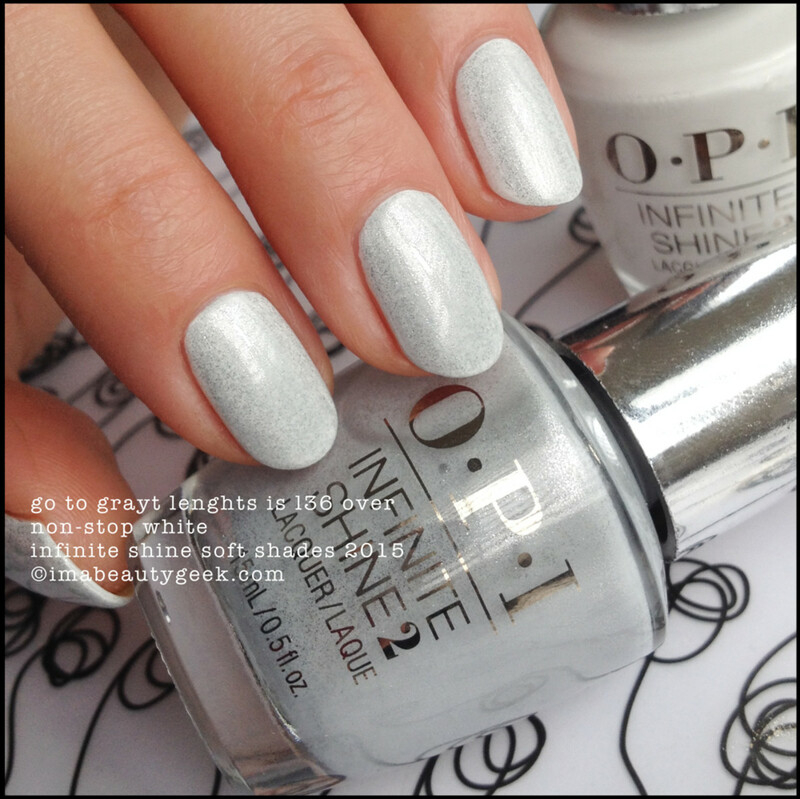 OPI Infinite Shine The Beige of Reason – Soft Shades 2015 (above). I’m very nearly naked. I’m sporting a single coat of The Beige of Reason and it makes my nails look clean, tidy, and bright. If there was ever a sheer that was exactly the right shade for me, it’d be this one. And you know what? Without this swatch, I would have left it on the shelf. From the bottle, I&apos;d have thought it was a little more opaque but it’s not. Instead, it’s my new favourite sheer! So there you go, fellow polish junkies! 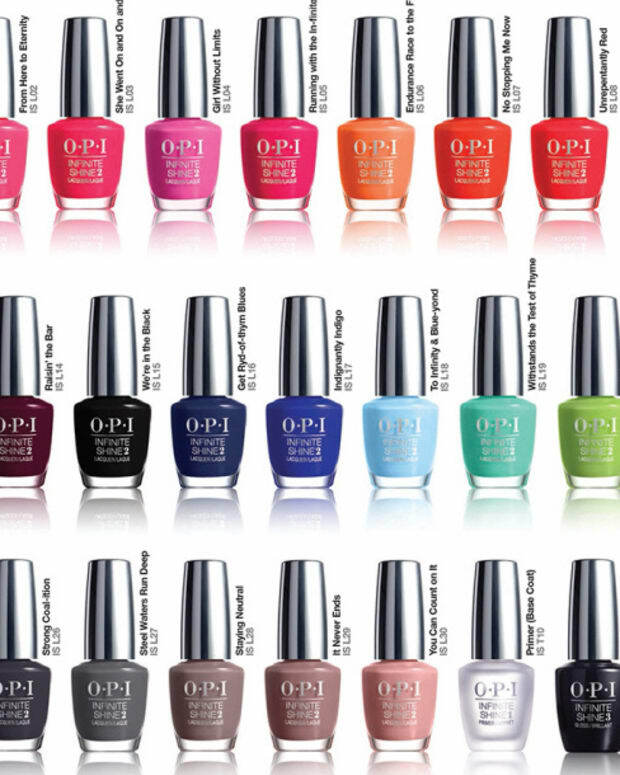 Yet another OPI Soft Shades 2015 collection for you to consider. Starting sometime in May 2015 they’ll be available in the US from Ulta.com. In Canada, you’re gonna wanna hit up TradeSecrets.ca because they’re totally gonna have ‘em in-store and online. Any of these going on your list of things to buy? Me? I’ma take that Beyond the Pale Pink and I’m outta here! Oopsie! Before I go, I should add in all the links to things so everything is easy. Here’s OPI.com, and here’s OPI Brights 2015, a whack of Infinite Shine swatches, the regular OPI Soft Shades 2015, OPI Hawaii (which I’ve seen bits of at Winners, by the way), and of course, the very first swatches & review of OPI Venice to hit the interwebs, courtesy of meeeee!! OPI Coca-Cola’s 100 Anniversary is coming soon too. And something else but I can’t remember what it is on account of the fact it’s after midnight and my brainz is dead.